Weight 432 pounds. 1231 pounds. 1181 pounds. Dimensions 29 inches x 37 inches x 38 inches. 48 x 53 inches. Not specified. Power Source PTO. PTO. Electric over hydraulic drive PTO. Engine Capacity/Limit 20-45HP. 30-90HP. 35-100HP. Warranty 2 year warranty. N/A. 12 month warranty, 90 day parts warranty. How to Select the Best PTO Stump Grinder? However, you know your needs better than anyone else. We’ve put together this buying guide to provide enlightenment on the many different PTO stump grinders for sale. Getting the right tool for the job is important, so review these various products below and get the best PTO stump grinder for the money. You never know, a handheld or portable option might be closer to what you actually require. When the time has come to purchase a new PTO stump grinder, you need to work out whether it’s actually the best product for you. The first step is to consider the work type. What will the machine be doing? Do you have a large lot needing cleared for development? Do you own a small farmlet with a tractor, but you only have a few trees? Think about the work needing undertaken and this will help you decide whether you need a PTO stump grinder or something equally as portable, but not as big. PTO stump grinders are dangerous pieces of machinery, so all care must be taken when you’re operating one. As part of the routine maintenance check, you should make sure all safety guards are in place. You should also use ear and eye protection when you’re using the machine. It doesn’t hurt, either, to have someone with you while you’re using the machine, to help you if you run into trouble. How efficient does your PTO stump grinder need to be? Does it need to follow you for several miles behind the tractor, skid steer or excavator, without missing a beat? Does it need to pull several stumps per day? How big are the stumps? Features of a PTO stump grinder vary depending on both the towing vehicle and the grinder itself. When you’re looking for the best stump grinder for the money, you need to factor in the features in relation to the cost. The best stump grinder is one that removes tree stumps with ease, whenever it suits you. 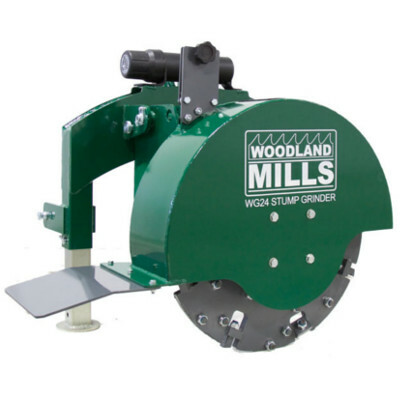 The tree stump grinding attachment is generally fitted with a friction slip clutch, and connects to standard linkage with a 3 point attachment. Pay careful attention to the HP limit. Not all PTO stump grinders are suitable for all towing vehicles and machinery. It also pays to be aware of the cut limits. Many PTO stump grinders have above-ground limits of around 25 inches, and below-ground limits of around 10 inches. 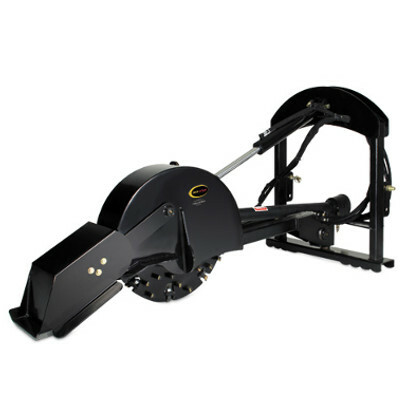 They can either be solely used for stump grinding, or can be used as a root cutter as well. Maintenance on a large PTO stump grinder can be quite time-consuming. However, failure to undertake regular maintenance can be extremely dangerous. Check belts are in good order and are properly tensioned. Make sure the teeth are sharp and are in good condition. Check oil and fluid levels. Check that all guards are in place and are in good condition. Make sure the cutter head rotates freely and isn’t obstructed by debris. Make sure the kill switch works. Make sure the debris curtain is working. Out of all stump removal options, PTO stump grinders are one of the most expensive options on the market. This is because they are very technical pieces of machinery that feature many parts. When you’re looking for the best PTO stump grinder for the money, be aware of your budget. Check out the list of features for each product in relation to its cost. The cheapest option is not always the best option. It has a chainsaw holder attachment. It attaches quickly and easily to a tractor. It’s a powerful stump grinder. It’s very affordable in comparison to similar products on the market. It only has a two year warranty. It’s not suitable for smaller areas as it’s quite large. Dimensions: 29 inches x 37 inches x 38 inches. QHow big is the grinding flywheel? A24 inches in diameter and ¾ inches thick. QHow deep will it grind below the root? AWith a 3 point attachment. AIt’s suitable for use as a commercial grade stump grinder for professionals, construction workers and those working in the industrial sector. If you’re looking for a piece of stump removal machinery that does what it says it does, this Woodlands Mills PTO stump grinder is for you. It’s powerful, hooks easily with its three point attachment onto a tractor, and never misses a beat. It’s also very easy to maintain and clean. Reviews of this stump grinder have been positive, and it’s even for sale at a very affordable price. Overall, it’s one of the best PTO stump grinders for the money. Check out what other people who purchased this product think about it. Read WG24 PTO stump grinder reviews. It has a heavy-duty base stabilizer to enable you to grind more efficiently. It delivers 810 RPM to the rotor for quick, precise cutting. It can cut 25 inches above ground. Finding warranty information is difficult. Its not a bright color like many others, which makes it difficult to spot in large fields. Dimensions: 48 x 53 inches. QHow many teeth does the cutting disc have? QWhat size is the rotor? QWhat is the maximum cutting depth? In terms of power, durability and reliability, this Stump Eater packs a real punch. It’s suitable for a large range of tractors, can cut nine inches deep, and has a very competitive price tag. If you’re looking for a commercial grade PTO stump grinder that will cut several stumps with ease, this is a good option for you. Check out what other people who purchased this product think about it. Read Stump Eater PTO stump grinder reviews. It’s suitable to be used in commercial or industrial environments. It costs quite a lot in comparison to similar products online. 12 month warranty, 90 day parts warranty. Power Source: Electric over hydraulic drive PTO. Warranty: 12 month warranty, 90 day parts warranty. QWhat is the maximum cutting diameter? QHow many teeth does the cutting wheel have? Reliability is important when you’re undertaking big stump grinding operations. That’s why this Stump Buster Stump Grinder is top rated on the market. As a commercial grade stump grinder, it’s reliable, durable, and does all a professional needs to remove stumps with ease. Even though it’s not the most cost effective option on the market, it’s certainly one of the best. Check out what other people who purchased this product think about it. Read Stump Buster SC-50 PTO stump grinder reviews. Where to Buy 3-Point PTO Stump Grinder Attachment? When you’re in the market to buy commercial grade and industrial PTO stump grinders, there are plenty of places to look. Firstly, you can look in agricultural stores selling reputable manufacturers and models, but did you know you can also buy online? You can often get the best deal when you search on the internet for particular manufacturers and models of grinding equipment.